As a photojournalist, when do you capture a scene the way it is vs capturing it as the way you think it is. Last evening, I was driving in the buffer area of TATR and came across two women collecting Tendu leaves (leaves of Tendu are used to make indian cigarettes) in the forest. I stopped to take their photos. One of the lady’s name was Shakshi and I was trying to take her portrait with the leaves. Obviously since it was a stranger, who suddenly landed up, she was stiff and expression-less. I asked my guide Santosh to tell her to smile a bit for the photo. She did not right away, but after asking her twice, she finally did smile and I took her photograph. I took some more shots of them collecting the leaves, thanked them and left. Sakshi, before I asked her to smileAs I was driving back, I was thinking about Shakshi and the photo that I took of her. Is she happy that she is a tribal? Does she think she lives a happier life than people in the urban jungles? Does she feel marginalized in the forest? Which of my photograph, represents what? There have been endless debates between biologists and social scientists. 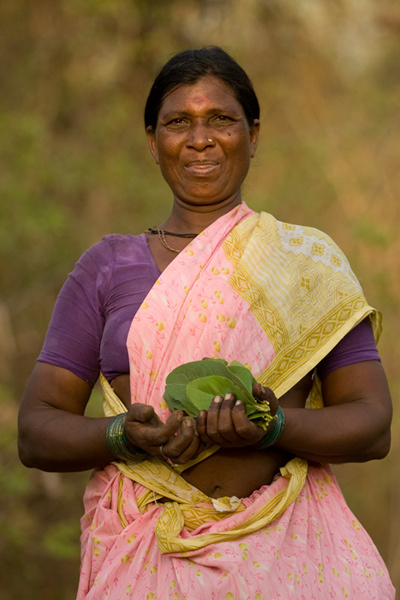 The former contend that tribal relocation from the forests is fundamental to the conservation of wildlife and say most tribes prefer to move out, the latter argue that the social costs, which relocations impose upon oustees, outweigh any benefits that people-less nature provides and people are happy to be living inside the forests. I cannot help but think that the first photograph supports the case of the former and the second one for latter. Have I distorted the story by asking her to smile for the camera or is she really a very happy lady? Have I imposed my views about her in the photograph by asking her to smile? (though I fight for wildlife, I believe historic injustice has been done for the tribes and they must be respected and made part of the conservation process). I do not know the answer, but its scary to know that a portrait is not just a portrait. Thankfully the recent Forest Rights Act will help give the people inside the forests their rights. Another issue that I come across is the fact that the people in the villages are themselves divided on what they think is the best option and unfortunately the decisions are usually made for the village as a whole. Interesting thoughts Kalyan. A few days back, I ran into another gentleman (in Masinagudi) whose thoughts on conservation were that there can be no conservation without involvement of the locals and ensuring that their livelihood is not ‘forsaken’ at the altar of conservation. I am putting down his thoughts as I understood them below. The largest mistake made in conservation in India was when hunting was made illegal. It is a reality that the human being has already encroached on the territory of wild. For good or for bad, that is a reality and one has to work with that in mind. Laws today are towards protecting the wildlife and someone who has lost a near and dear, lost crops etc cannot within the ‘legal’ ambit act to protect their interests. Does that mean they will do nothing about it? No. Damned be legality. They will act. And many a time rashly and would you blame them when they have had to bear a loss? Also given the empathy and sympathy of the folk around them, the ‘law’ is anyway going to be rendered useless. No, it isn’t that hunting has to be allowed indiscriminately and the ‘poachers’ have a free hand or for that matter even ‘game hunting’ isn’t what is being advocated. But hunting based on licenses where the right sort are allowed to ‘cull’ (that’s the word he used). Yes, it does come with the danger of it being misused. That can be controlled however. The current approach of employing a law which prevents it outright is however clearly a failure. I don’t think we have enough numbers in any species in India to go after that kind of approach. I do not want to get into who is right and wrong here as it is very context specific. I read the post by Nagesh, and the response by Kalyan. Agree with Kalyan. For cull and approcahes like that the native popelation of fauna has to far exceed what the land can support. We in india dont have that good problem. We have already taken away the land and the populations of most species have dwindled below aceptable levels. Allowing hunting will only result in extermination of entire species and subspecies. Need to be mindful of the needs of local people though and a solution needs to be provided to them who have depended upon the wild for livelihood for thousands of years. But that solution could be education/grants/skill set training and reloaction etc. Very lovely simple and apt post Kalyan. Just similar thoughts came into my mind when i was reviewing some of the images i shot of villagers and nomads for a book recently. The first few frames they had some really rigid expressions and over a period of time i had them smile to my shutter. But but looking back at the images at the comfort of my ac darkroom i feel that is what is depicted in the second half of the images their real personality ? As you told its two sides of a coin the way we want to see it – ie that of a photojournalist vs photoartists and at times its really debatable but at the end of the day i will just like you sit and enjoy the work and redirect the work to the appropriate place where it fits the bill. Its interesting how we try to group people according to their origins. That probably stems from the fact that our country is so diverse that grouping really helps give identity to the people. Yet, it would be nice if the rights of every human being is protected in a uniform way (#asking2much) irrespective of where they are from or where they live. I believe the forest rights act is a step in the right direction and I also believe in making the tribals a part of the conservation process. I am not very well aware of the details (which needs to be corrected) and so will stop at what I hope and believe. I feel that it is not possible to showcase a story of an entire tribe or place with a portrait of a single person. The number of questions you are thinking about seem to suggest that this is an entire photographic project by itself and should rightly involve a lot of people from the tribe/tribes. Having said that, just by looking at the first photo, it made me think of the troubles she is going through and your thoughts about her tribal life and the state of tribes seem justified. But, the second photo made me think that her worries/happiness is more related to her daily chores. She is probably thinking of how much money to make that day, or what to cook, or maybe something about her daughter/son. Smile made it more personal. So, Yeah, those two shots separately showcase the power and responsibility of a photojournalist. FRA is surely a good step forward. Right now FRA takes care of giving the rights for the tribes. Making the tribes actually part of the conservation process would be a great move, but FRA has not provision for that yet and it must be done in a case to case basis. Some people are trying these models in NE India. You are right about the project. The photo is meant to be used in a larger context on the same issues though. This is a very good topic of discussion. When it comes to wildlife acts it would be nice when it covers tribes and relocation plan and conversation road maps. Unfourtunate we dont have such a mature model at this point which gives more room for improvements. None of us know the answer, Kalyan. It’s been frustrating to see various panacea formulated by ‘experts of the urban jungles’ on the subject. A true questioning with an unbiased mindset like this is what we all lack. Thanks for a thought provoking post! Isn’t the grass always greener on the other side? Impressive thoughts! Great thought provoking post Kalyan! Since the ages, these are the tribal people only who settled in the forest. They are the integral part of these forests. As far as relocation process is concerned, time has come to rethink about it. Without the participation of locals in and around any jungle, how can we protect the jungles and wildlife there in..? Instead of revenge, tribals have the tradition of worshipping Tigers who killed their family member. Can we city dwellers even think such anything..? Their demands are very less. Instead of going positive and benefitting the socity with their traditional knowledge of local habitat and wildlife, we are trying to push them out. Kalyan, you initiated a very good discussion here with this post. But can we people rethink about the ongoing policies regarding tribals living in the jungle…? The Forest Rights Act does exactly that Shalik. Many are very skeptical of the FRA, but implemented right, this will finally give them the right freedoms in their lives. Adivasis are the tribal people,reserved by nature.Normally they will not open out to strangers.It is but natural, because of there living on there own and in isolation.By nature they are peace loving, very methodical and meticulous in there working.If you step in ,into there tribal huts you will see the neatness,the orderliness of there living habits.In the instant case of photograph of the tribal lady, collecting the tendu leaves gives an expression of there working habits.The ladies holding the plucked tendu leaves in a hand, which she has were carefully and meticulously plucked each leaf from the growing and matures tendu leaves from the shrubs, which usually sprout to maturity in the peak of summer month of may.Because of her long association with the forest from the ages gone by, she has the wisdom to make a choice for the right type of tendu leaves which is marketable and fit for rolling a bidi.This speaks to the maturity of the tribal women, viz a viz other outside labourers who invade the forest through the agency of the contractor and destroy the forest of tendu trees in their greed to collect maximum leaves and thereby maximize there earnings. Amazing Posting..1000s of people living in rural areas or tribal in UP r hardly interested in staying..they all r migrating to cities…strange bt thts true tht tribals or farmers are no more willing in continuing their work. Many Reasons could b thr…improper facility avaible from govt, they attracted with city life etc…Hard to say these are our rich assets which will soon perish if they r not properly taken in to consideration…. You should never generalize. Never mix up rural populations and tribals as they are totally different people. Most of the tribes just want to be left alone without big companies eating into their land or being forced out of their historic forests. But yes, many would like to move out and our forest department has good compensation packages to achieve this. Moving them out, with consent is fine. But most often, it has been with force. Rightly said Kalyan..Thanx for sharing.. Your post raises some interesting issues in photography and narration. Your point explores ethical dimensions around the form and meaning of the image in ways that distinguish it from other texts. But let me push a bit further – in part because I think you’d be open to it and also because a group of my colleagues are in the process of forming their own rules and guidelines for using photos. I was remembering back to when I was a photojournalist and student in comparative literature. I was asking similar questions, but it wasn’t until much later that the answers and methods of analysis became available to me. Reading images takes a bit of additional learning that isn’t usually part of our education. I think this is because images are assumed to be faithful representations of reality. They are included with movies as documents that just show something, and the way they construct meaning is intuitively obvious. There is, after all, a visual grammar within the text of an image. Understanding the interactions between the syntactic/semantic elements (the story/visual form) of that image text is just as important as the visual form of the image. It’s the difference between looking at objects/forms versus relationships versus both. Your image of the tribal woman is quite compelling. There are rich tonal hues and complementary colors between her choli and the leaves, and the warm cast of the sun adds a familiar glow. Also, consider the effect of focus. In the first image, the leaves are out of focus and in the second the depth of field is much deeper. She is posed in a sort of medium shot, and so the attention is as much on her costume, jewelry, and stance as it is on her expression and the leaves. For all I know, she could just as easily be standing next to a pan stand in Bangalore. That said, the main reason the image is compelling is the woman’s gaze. We are cognitively biased to connect with people’s eyes, and her direct gaze with the camera is an invitation to engagement with the photographer, the camera, and the viewer. This should not be treated as something without its own consequences. I actually think the gaze has much more important impact on the image’s meaning than the smile – precisely because it suggests connections not shown in the photo – and that connection is much more open to interpretation. In contrast, imagine if the woman had been looking at the leaves or at something out of the frame. Her expression would immediately be perceived somewhat differently. Her relationship to the viewer would also be interpreted differently. Kress and Van Leeuwen’s text, “Reading Images: The Grammar of Visual Design” is a great introduction the social semiotics of images. But let’s also look beyond the form and syntax of the image and towards the context, because her gaze has brought the photographer and us into this relationship. I think it’s interesting that you described yourself as a photojournalist in this post, and not as a nature photographer as you do in your “about” section. I am not personally invested in distinguishing between the two, but I think they imply different rhetorical stances towards a subject. The distinction raises interesting issues. Is the woman a part of nature? Is it more politically-correct to shoot images of people as a photojournalist and not a wildlife photographer? If this is photojournalism, what is the news story and plot elements of a story being covered? How is she contributing to that narrative? So you can see, all of our social positions and descriptions can be affected by this relationship. Certainly there are long histories of photographing “others” that have contributed to ethical discussions among photographers and ethnographers. The uncovering of “natural” history is deeply linked with these kinds of distinctions – as well as ideals about power, identity, post-colonialism, industrial modernism, and so on. But this brings us to what I think is the critical juncture. What is the documentarian’s role in brokering this relationship? This is the question you raise – as in when is a portrait not a portrait. My feeling is that this question is an artificial one, invoked when you intervened and asked her to smile. The woman had a normal response to someone unknown to her, snapping her image. What if someone asked you twice to smile? Would you have done differently? You intervened – asking her to smile. Are tigers asked to smile? How about ants? It’s partially because you can, that you did. What if she said no? What if she could say no? And what if you weren’t male? And then there are the obvious implications of her knowledge of the technology, its uses, and so on, but I believe these are really secondary. Likewise I also feel the meanings of “happy”, “tribal”, “urban jungle”, “marginalized”, “illegal” are also secondary, but they are nonetheless important to her understanding and our understanding of the context. The photojournalistic stance, I think, is one of documentation, not rhetoric. The rhetoric should instead be shifted to the relationships that the subject owns and not the political interpretations of “biologists and sociologists”. This helps us recognize what is worth showing and what is less valuable. For instance, if the rhetorical goal is generate an emotional response in the viewership in favor of a preferred political position, then by all means her direct gaze may prove most useful. However, if the goal is to demonstrate her personal and tribal relationships with the forest and how their systems of knowledge define their roles in the ecosystem, then I think it’s way more useful to show those relationships in the image. After all, those relationships are what happens in those spaces everyday, and they are the ones that lead the to changes in species diversity and richness that people seem to care about. Showing that, to add to controversies between biologists and sociologists, may prove more productive in the long term. The key, I think, is not to gloss over those systems in which “native” knowledge relates to biodiversity. It is and will be different across tribes, rural, and urban experiences – no matter what tribe you are from. But I do feel something is lost in those relationships when we simply utilize the “human element” of emotional appeal – which is very much operating in this image. Scott Atran and Douglas Medin’s book, “The Native Mind and the Cultural Construction of Nature” delves deeply into how knowledge systems in different tribes in South America affect conservation assumptions and forest biodiversity. because socio-ecological systems are bound tightly, it pays for long-term strategic planning and public communication to engage with those knowledge systems – not just project our own assumptions. I should ask for forgiveness upfront. I am an American, and when I offer criticism, I sometime cause hurt feelings because I say what I think is relevant. I assure you that my comments are intended to add to the range of discussion and considerations – not cause pain. But then, I think that is also your position in relationship to your subject. Are you just reaffirming what they did, or taking a rhetorical stance? For more also on ethno-photo ethics, Jan Chipchase is a good, pragmatic source. Hi Gabriel .. I think that was a great analysis of the photographs but I guess your missing the point. The ongoing debate is whether the local tribes should be actively involved in the conservation process and further whether the existing laws should be forced on them or we should also take into consideration their point of view? Honestly, its not about you being an American or I being an Indian. We Indians are open to constructive criticism but in the end its about what is right and what is wrong and whether it is justified? Great post though Kalyan. I’ve definitely have my thinking cap on !! I think you are reading too much into the photographs. It is natural that people are shy everywhere be it an urban setting, rural setting or a tribal setting. 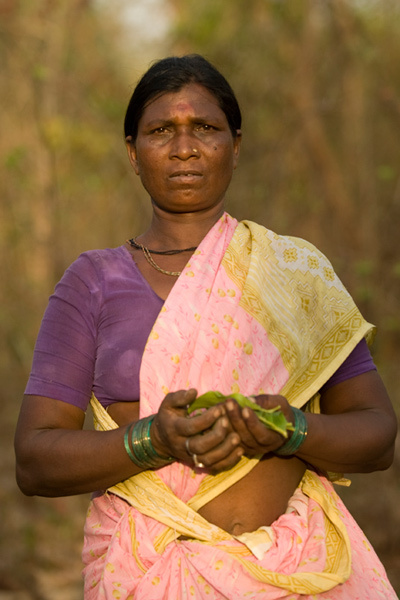 This is a posed portrait with universal emotions which cannot capture the debate about tribals and conservation. I think trying to ascribe aspects of the debate to the photographs will amount to misleading the viewer. Nevertheless I think both the pictures are beautiful. Time you got back.Looking forward for a long talk with you. Doing “development” in a district with 82% forest cover teaches you many things. This logic holds true for not just portraits but for everything like a story or any photograph. It is always what you chose to see and what you chose to show. It can never be an accurate representation of what happened or who the person is. It can only be your perspective. I mean, for all you know, she might have been actually happy that day for some reason. Most Photographers are artistic in temperament and hence are (strongly) opinionated, so advocacy driven by an ideology from that high horse is acceptable and is ok to me. But when the artist ends up working like an objective journalist — who are supposedly facts based — conflicts arise. Its not like even objective journalists don’t have opinions or advocacy positions but its just that they are trained to handle it- at least the good ones are anyway. And more importantly journalists are not artistic in temperament. So these conflicts dont consume them and where bias exists, they are professional about suppressing or dressing it up. So opinion is ok for me, so long as its not sold as facts. I am blown by your Wildlife Photography and this short, but an intriguing piece. I read about you in Rashmi Bansal’s Connect The Dots. You are an inspiring icon for us artists. I am a Creative Freelance Writer and highly amazed by your journal and photographs. Keep us inspiring! Thank you! In my opinion, the tribal people do save our nature and acts as conservationist. But the social pressure and demand of the society, and cost of living force them to do all such things. Will that not be possible to guide these people in the right direction? showing them the way that how they can live well with managing cost of living(starting business/home production or activity towards conservation which can fetch money) and also they can conserve our nature. Forests are for wildlife. Not for humans. If humans have to live in forests, then they need to be provided with sanitation, schools, markets for their economic activity, common community space, etc but doing so will destroy the forests. One cannot expect humans to live in forests as primitive cave people. So forests are for wildlife. Hi Kalyan, only recently I read the book “connect the Dots”. What really cought about you story was you had stayed in Jungle Resorts in Bandipur after 2004, call it coincidence or something but I was there during May 2005 in the same resort and it was you, who had introduced us to the beauty of the wild..!!! Little did we know that I would get re acquinted with you in this way..!!! Keep up the good work, and photographs, and your journal too, is really amazing…!!!! Forests are for wildlife. Not for humans.. The tribal relocation from the forests is important in fact, necessary to conserve wildlife. We should make sure safety and livelihood is provided for these tribes. Point-blank: First, its UNETHICAL for you to have, first, clicked and then posted this picture here on your blog. You and your ‘tomtom brigade’ shall jump the gun by asking “but how?”. The subject of the photograph is quite unwilling, her unsmiling gesture reveals it. Second, you exert power over her by asking her to smile with a camera in your hand ready to ‘shoot’. Has anybody ever wondered why we always prefer “shoot” rather than “click”? Its a colonial hangover, just like that. Third, by clicking these pictures you become their owner and assert your ownership by displaying them shamelessly on your website for public exhibition. Also, by doing so, you are earning ‘capital’ at her expense. Fourth, she is as helpless in controlling the circulation of her picture as she was when you ‘shot’ her. Also, she can’t share the ‘capital’ thus earned with you for she neither owns a camera nor she has an internet connection in her hut. Fifth, you didn’t enter into any contract with her before taking the picture. She is not aware as to how her picture shall be/is being used on the cyberspace. Sixth, have you paid her for this photograph? Did you give her a printout of these pics? Did you tell her that you make money clicking pictures and since she features in your pics she deserves to be paid? Did you tell her that she has the right to say “no!” to you, that she has the Right Against Representation? How true when you say: “A portrait is not just a portrait”. Now we know the real reason why. While we have driven the Angrez out of our land shall we ever be able to banish colonial Angreziayat out of us? Just because you have the capital to buy an expensive camera doesn’t mean that you automatically get the divine rights to ‘shoot’ anybody!!! I find this interesting. In facto met you in BR Hills along with my two brothers in 2006/07,when you were on Sabbatical from Yahoo. I also got to know your father Prof. RR Alluring, due to my association with Alliance university. I am delighted to see your blogs. Right now I am in Boston and will be back home around mid October.